The Northern Diver Bodyline Thermalskin undergarment fits like a second skin under your drysuit or wetsuit. 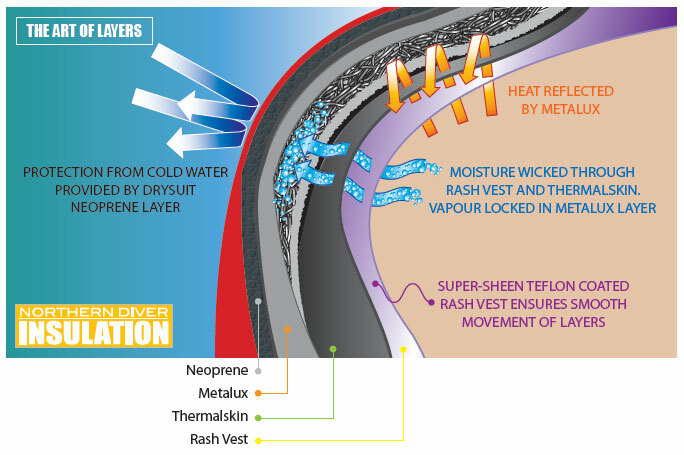 Thermalskin has proved itself to be an incredibly versatile product. It is not only used by the diving community but in many other walks of life where keeping warm is essential. Many divers are now using their Bodyline/Thermalskin undersuit as an additional layer of insulation beneath their wetsuits. This is proving to be very successful for those who want to wear their semi-dry wet suit for longer durations, deeper dives, or in cooler waters. Cavers have also adopted the Body Line/Thermal Skin for use beneath wetsuits, or caving suits, for comfort and warmth on long trips underground. Even members of some Mountain Rescue teams wear this undersuit for cold nights on the hills. Constructed from moisture-wicking fleece and super-stretch Lycra for additional comfort. It can be worn on its own, under your drysuit in temperate conditions, or as a first layer in conjunction with the Northern Diver range of Metalux undersuits for colder conditions. However it is used, the Northern Diver Bodyline Thermalskin undersuit offers a comfortable and lightweight solution to combating the cold.